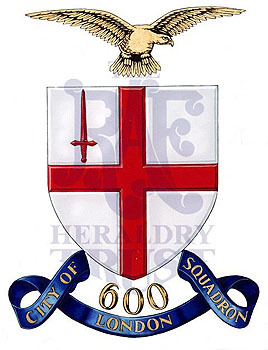 Soon after the squadron was formed in 1925, it created a badge, appropriately based on the City of London’s Cross of St George. This appeared on their silver and trophies, aircraft, writing paper etc. and even on a silk Standard long before official squadron Standards were introduced (after the War). 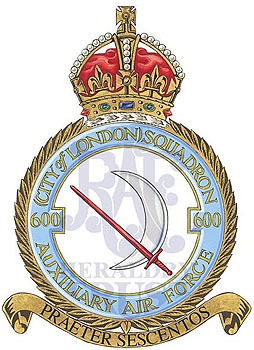 When, years later, squadron badges were being introduced into the RAF, 600 asked the College of Arms to approve the ‘City’ badge and incorporate it into the the standard squadron wreath and crown with an appropriate motto. The College refused, partly because of the heraldic incorrectness of putting anything (in this case the RAF eagle) above the city badge. Instead, they suggested a wren, not a very appropriate bird for a fighting squadron. After an argument, the matter was dropped and 600 simply went on using the ‘heraldically impure’ badge – without any motto. After some years of war when, due to promotions, casualties and other postings few 600 men were left in the squadron which was by now in North Africa, a new CO who was unaware of the story realised that there was no official badge and so had one designed and officially approved by the College of Arms and the King – a moon and scimitar, certainly appropriate for a night fighter squadron which is what 600 was at the time. However, immediately after reforming as an Auxiliary squadron after the War, 600 continued to use its original badge as before, while the unkindly christened ‘Moon and Paperknife’ badge languished in a dusty cupboard. Then the Queen became Honorary Air Commodore of 600 Squadron. She was presented with a diamond Squadron Badge – the original ‘City’ one, of course – but in case of causing any embarrassment Her Majesty was told the whole story before it was presented. She immediately accepted it with a smile and said “I’ll have a word with the King about it”. Soon after, 600 had an indignant Chester Herald on the phone saying ” If the King says it’s got to be then it’s got to be, but I still say it’s all wrong” and the original badge, just as originally depicted with no motto and no surround was at last formally approved and signed by Chester Herald and the King. The King would obviously not go back and cancel his signature on the ‘Moon and Paperknife’, so 600 ended up in the unique position of having two official badges, the ‘City’ one which was used all the time and the other which was never used. When the Squadron was awarded its official Standard (600 was only the second squadron to get one after 1 Squadron) it was presented by Her Majesty, by then the Queen Mother, on parade at Buckingham Palace and proudly carried the ‘City’ badge.